Want to produce online content that will capture attention and boost your sales? Consider my 11 ideas, which were featured on Ragan.com! Read the full story here on Ragan.com. Content marketing is huge, and companies should be taking advantage of this awesome opportunity to create your own content. 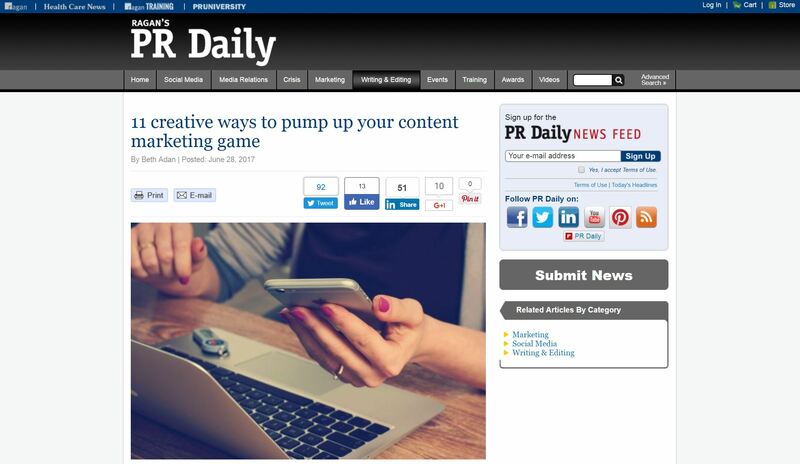 An article I wrote, 11 creative ways to pump up your content marketing game, was recently published on PR Daily! I’m proud to share that an article I wrote, 3 PR Lessons from a Netflix Crime Show, was republished on PR Daily! PR Pros can do several things to help their clients maintain a positive brand reputation. PR Daily recently republished my article detailing strategies. “Managing your organization’s reputation is important to avoid potential crises and negative publicity. Infographic Picked Up by PR Daily! Check out the article and infographic here. My article, 3 PR Lessons from a Netflix Crime Show was featured on Ragan’s PR Daily. My recent post, ‘3 Ways PR Pros can Maintain a Positive Brand Reputation’ has been featured on PR Daily! There are several things you can do online to make sure you brand’s image remains top-of-mind and is shown in a positive light. Being proactive to optimize content and stay on top of potential negativity can help you stay ahead of the game. Read the full article on PR Daily. ‘3 Reasons for Failed Pitches’ Featured on PR Daily! 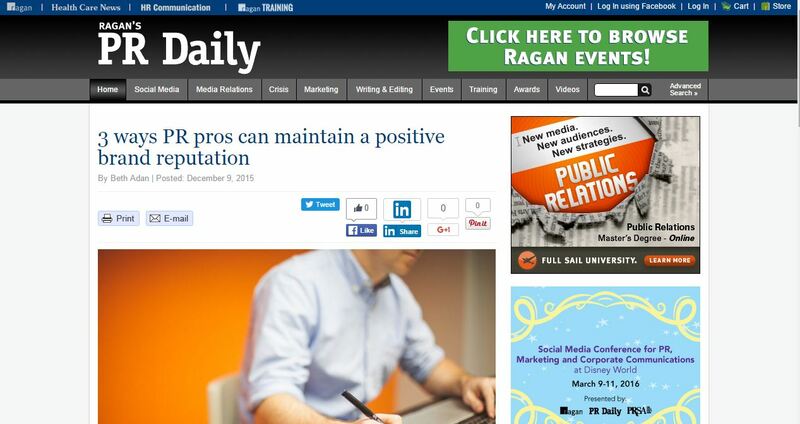 My article, ‘3 Reasons for Failed Pitches’ has been featured by Ragan’s PR Daily! “Contacting journalists and getting your brand placed in a story begins with writing a pitch. Crafting a message that is strong and interesting can be a challenge—and there are several mistakes that many PR pros make during the process. Though you are writing a pitch to introduce a journalist to your brand and share why they should cover your story, don’t make the mistake of making it all about you. Read the full article here on Ragan’s PR Daily. Story originally written for Three Girls Media.